Drawstring closures on trash bags make your garbage bags easy to to lift, carry, tie and toss away. Made of Low Density thick material, they can easily handle standard household trash and make a great choice for your Kitchen. 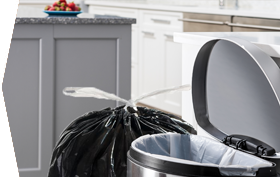 When choosing the right trash bag for your kitchen remember, the higher the mil, the thicker the bag.